Visitors to the Grand Lodge of Oklahoma building or the Scottish Rite Temple in Guthrie are met by an assortment of wonders. The same can be said of the McAlester Scottish Rite Temple, which leads one to believe that these three major collecting institutions have gathered up all of the Masonic treasures related to Oklahoma that exist. The diligent curator knows this is by no means true, as un-discovered treasures can still be found in the most unlikely corners of the country. This was just the case recently when a gold and silver dealer in Florida came into possession of an amazing collection relating to Oklahoma Freemasonry. There are a few family names in Southeastern Oklahoma that really resonate with those that call Little Dixie home. McAlester, Busby, and Albert are as much household names as Pete’s Place, Isle of Capri, and Roseanna’s. One of those old names that has remained memorialized is Hailey, Daniel Morris Hailey in particular. In fact, just a short drive east from McAlester on Highway 270 leads one to Hailey’s very own town, Haileyville. Hailey was then exalted to the degree of Holy Royal Arch in Indian Chapter No. 1 of McAlester on May 15, 1878. He would serve as High Priest of Indian Chapter in 1897 and 1898. [xvi] Hailey was elected Grand High Priest of Royal Arch Masons of Indian Territory in 1908. [xvii] One of the pieces comprising the newly acquired Daniel M. Hailey Collection is his Past Grand High Priest jewel. The jewel is of a style that was presented to many early Grand High Priests, including other notable Masons such as Joseph S. Murrow. The jewel features the breastplate of judgement surrounded by a wreath, indicating the rank of Grand High Priest. The degrees of Cryptic Masonry arrived in Indian Territory in 1883 at Atoka with the chartering of Oklahoma Council No. 1. This council held jurisdiction over all of Indian Territory until 1894 when Muskogee Council No. 2 and Union Council No. 3 at McAlester were chartered. [xxi] It was in Oklahoma Council No. 1 at Atoka that Hailey received the degrees of Royal and Select Master on June 20, 1888. [xxii] Hailey would serve as Grand Illustrious Master of Royal and Select Masters of Indian Territory in 1901. [xxiii] Another piece comprising the Daniel M. Hailey Collection is his Past Grand Illustrious Master jewel. The jewel features the secret vault and nine arches central to the ritual of Cryptic Masonry. It was coal mining that led Hailey to purchase a tract of land and establish the company town of Haileyville in 1898. [xxviii] Of course a town associated with a prominent Freemason would come to have a Masonic Lodge. Haileyville Lodge No. 245 was chartered on August 10, 1904. [xxix] The Brethren of Haileyville Lodge presented Hailey with a beautiful sterling silver Past Master’s jewel, which is now part of the Daniel M. Hailey Collection. The jewel features the Worshipful Master’s square, quadrant, and a blazing sun in gold tone. [i] Robert L. Williams, “Dr. Daniel Morris Hailey: 1841-1919,” Chronicles of Oklahoma 18, no. 3 (1940): 215-218. [ii] “Gen. D.M. Hailey, U.C.V.,” Confederate Veteran 28 (1920): 26-27. [iii] N. Wayne Cosby, “8th Louisiana: Company A ‘The Creole Guards,” Hardtack Journal, accessed June 21, 2016, https://sites.google.com/site/hardtackjournal/home/8th-louisiana/company-a. 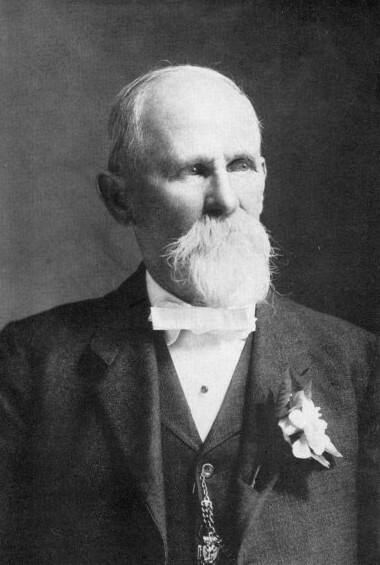 [iv] Daniel M. Hailey, Confederate Veterans of the State of Oklahoma (United Confederate Veterans, Oklahoma Division, 1913), 21. [v] “Gen. D.M. Hailey, U.C.V.,” 26-27. [ix] “Gen. D.M. Hailey, U.C.V.,” 26-27. [xiii] Robert G. Davis, The Honored Men of Oklahoma Scottish Rite Masonry (Oklahoma Lodge of Research, 1997), 32. [xvii] Kenneth S. Adams, William A. Hensley, and Norman E. Angel, History of the Grand Chapter of the Royal Arch Masons of Oklahoma (Grand Chapter of Royal Arch Masons of Oklahoma, 1964), 102. [xix] Raymond L. Holcomb, Father Murrow: The Life and Times of Joseph Samuel Murrow, Baptist Missionary, Confederate Indian Agent, Indian Educator, and the Father of Freemasonry in Indian Territory (Atoka County Historical Society, 1994), 105. [xxi] Charles E. Creager, A History of the Cryptic Rite of Freemasonry in Oklahoma (Muskogee, Oklahoma: Hoffman-Speed, 1925). [xxiii] "Grand Council of Cryptic Masons of Oklahoma: Past Grand Illustrious Masters," Oklahoma York Rite, accessed June 21, 2016, http://okyorkrite.org/council/GrandIM.aspx. [xxiv] Ancient and Accepted Scottish Rite of Freemasonry, Transactions of the Supreme Council of the 33rd and Last Degree for the Southern Jurisdiction of the United States of America (Washington, DC: House of the Temple, 1917), 84-86. [xxviii] Stephanie L. Shafer, "Haileyville," Encyclopedia of Oklahoma History and Culture, accessed June 21, 2016, http://www.okhistory.org/publications/enc/entry.php?entry=HA001. [xxix] Masonic Centennial Lodges (Oklahoma Lodge of Research, 1974), 207. [xxxi] Ancient and Accepted Scottish Rite of Freemasonry, 84-86. [xxxii] Ron Minshall, e-mail message to author, April 12, 2016.